The Game Developers Conference (GDC) kicks off on Monday, February 27th with our annual Google Developer Day. Join us as we demonstrate how new devices, platforms, and tools are helping developers build successful businesses and push the limits of mobile gaming on Android. Expect exciting announcements, best practices, and tips covering a variety of topics including Google Play, Daydream VR, Firebase, Cloud Platform, machine learning, monetization, and more. In the afternoon, we'll host panels to hear from developers first-hand about their experiences launching mobile games, building thriving communities, and navigating the successes and challenges of being an indie developer. 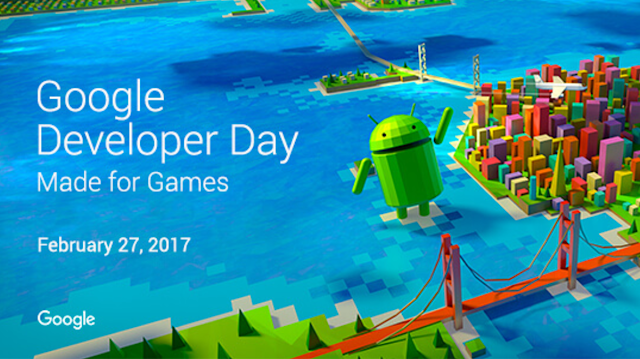 Visit our site for more info and the Google Developer Day schedule. These events are part of the official Game Developer's Conference, so you will need a pass to attend. For those who can't make it in person, watch the live stream on YouTube starting at 10am PST on Monday, February 27th.